easyMarkets is an online market maker that provides a platform for Contracts for Difference (CFDs) trading. CFDs are derivative securities that allow customers to gain exposure to the price of financial instruments without actually holding the instruments in their accounts. easyMarkets offers CFD trading in a variety of asset classes including forex, metals, agricultural goods, energy, indices and cryptocurrencies. The easyMarkets trading platform is known for its innovative features, including its proprietary dealCancellation tool, and its emphasis on transparent pricing. The company is home to over 300 markets and a range of trading instruments including spot trades, forwards and options. easyMarkets has received more than 40 international awards from industry watchers for its platforms and services. Traders seeking a transparent and professional online trading experience and access to a large number of CFDs in a variety of different asset classes should check out easyMarkets. 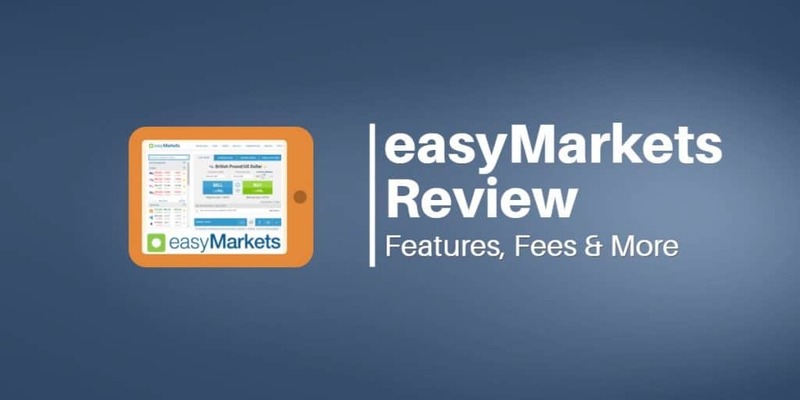 This easyMarkets review will cover all of the important details about the broker and discuss its major advantages and disadvantages. easyMarkets was established in 2001 under the name easy-forex. Over the next several years, the company enhanced its online presence and added new features and services for traders including a Trader Education Centre in 2007 and the first market sentiment tool in 2009. In 2010, easyMarkets added the popular MT4 trading platform to its offerings, and in 2011, it released an iPhone trading app. In 2013, the broker launched a full mobile site for all tablets and smartphones. easyMarkets also began an expansion into new product areas. By 2015, the company officially offered over 322 markets in a variety of asset classes. As a result, the company decided to rebrand in 2016 and change its name from easy-forex to easyMarkets. easyMarkets has headquarters in Limassol, Cyprus and a branch in Warsaw, Poland. The company has additional worldwide locations in Majuro, Marshall Islands and Sydney, Australia. Easy Forex Trading Ltd. is authorized and regulated by the Cyprus Securities & Exchange Commission (License Number 079/07). The MiFID Directive provides a passport, which allows the entity to operate throughout the European Union. Easy Markets Pty Ltd is authorized and regulated by the Australian Securities and Investments Commission and holds an Australian Financial Services (AFS) license (License Number 246566). easyMarkets offers customers dedicated 24/5 customer support in multiple languages including English, Polish and Arabic. Traders can contact easyMarkets customer service by phone, fax, email or live chat or directly through the company’s worldwide offices. easyMarkets is a safe and secure way to trade CFDs. Its subsidiaries are individually regulated by the following agencies: Cyprus Securities Exchange (CySEC) and Australian Securities and Investments Commission (ASIC). Cyprus is a European Union member and is a financial services industry hub. Customers in countries regulated by CySEC are eligible for compensation of up to €20,000 if easyMarkets fails. The Australian Securities and Investments Commission (ASIC) provides regulatory oversight of easyMarkets in Australia, New Zealand and South Africa. ASIC regulations ensure that easyMarkets' client funds are held in a trust and completely separate from the brokerage firm’s own money. However, unlike other jurisdictions, residents in Australia, South Africa and New Zealand have no additional compensation scheme in place to cover their deposits. That doesn’t mean it isn’t safe to deposit funds with easyMarkets. It simply means you are offered only the legal protection afforded by the Australian legal system. However, money held in trust in Australia is highly regulated and covered by the Corporations Act. Therefore, we feel happy recommending easyMarkets to residents of Australia, New Zealand and South Africa. Easy Forex Trading Ltd., the company that owns the trading name easyMarkets, is a privately held company. The Chief Executive Officer of Easy Forex Trading Ltd since 2014 is Nikos Antoniades. He was previously the Chief Financial officer of the brokerage firm from 2013 to 2014 and the Deputy Chief Financial Officer from 2007 to 2013. Prior to joining Easy Forex Trading Ltd, Antoniades worked as Assistant Group CFO for V. Ships Ltd and an Audit Senior at Ernst and Young, Limassol. easyMarkets offers its customers more than 300 products to trade. The brokerage firm divides these offerings into five categories: forex, metals, other commodities (agricultural products and energy), indices and cryptocurrencies. Gold and Silver: Day traders can trade spot gold and silver paired against a variety of currencies. Traders can also trade gold and silver as a vanilla option. easyMarkets offers four types of live trading accounts as well as a demo account. When you sign up for an account, the system defaults to a Standard Account. The higher-tiered accounts require larger minimum deposits, so once traders fund their accounts, they can opt for a different account type. There is an option that allows traders to switch from a live account to a demo account. The relevant underlying financial instruments and the type of account (see above) determine the easyMarkets spreads offered to traders. easyMarkets obtains the data from reputable third-party sources, which obtain the data directly from exchange feeds. easyMarkets receives its compensation through the market bid/ask spread. easyMarkets charges no credit or debit card fees or commissions. easyMarkets serves over 150 countries worldwide. The process of opening an account is largely the same in each jurisdiction. Before you can trade with easyMarkets for the first time, you need to answer a few questions. You enter your name, email, country of origin and phone number. Then you answer a few questions about your background and financial knowledge. Traders can make deposits and withdrawals by major credit cards such as Visa or MasterCard, wire transfer, JCB, American Express, Neteller, SoFortuberweisung or Skrill. Deposits by wire transfer may take as much as 5 to 7 days for funds availability, while deposits through Visa and MasterCard are the fastest. Depositing money in an account is straightforward. Traders click on the Deposit Funds button on the main screen. Traders then select the deposit method of their choice, fill in the required information and click “Submit.” The minimum amount required to make a deposit starts at 100 EUR. easyMarkets offers different amounts of leverage depending on the CFD product. Traders should consult the easyMarkets website for specific leverage allowances for each product. Each CFD also has specific easyMarkets margin requirements that traders must maintain. Traders who fall below the easyMarkets margin requirements risk receiving a margin call and having their position closed prematurely. Withdrawing funds from your easyMarkets account is easy. Some account withdrawal requests are subject to a minimum withdrawal amount. For withdrawals to credit and debit cards and eWallets there is no withdrawal minimum. The minimum withdrawal amount to bank accounts is $50USD (or equivalent in your currency). To make a withdrawal, easyMarkets requires proof of identity (such as passport or ID card) and proof of address (such as utility bill or bank statement). The proof of address cannot be older than 6 months and must show the customer’s full name and residential address. Other documents, such as credit card statement may be required depending on your account activity. easyMarkets notifies customers if it requires additional documentation. Customers should consult the Deposits & Withdrawals section of the easyMarkets website for details about withdrawal times. easyMarkets processes all withdrawal requests within a day of receiving them. However, depending on the final destination of the withdrawal, it may take between 3 to 10 business days for funds to arrive. The easyMarkets MT4 platform is a well-designed platform with excellent features for both new and intermediate traders. The web-based platform allows traders to navigate quickly and easily between different trading instruments. The first thing traders will notice is the large trading ticket in the center of the platform. The ticket allows traders to choose between the different types of trade categories that easyMarkets offers: day or spot trades, forwards and vanilla options in the case of a forex trade. There is also a tab to set a pending order. Main Trading Screen: The platform’s main trading screen gives traders access to the more than 300 different instruments without the need to pull up additional windows. The main page is set up in a logical and intuitive way. 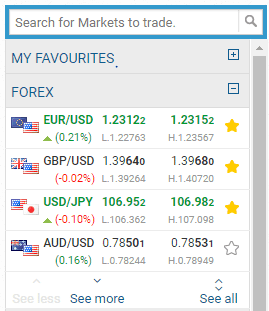 Market Explorer Engine: This panel contains the live prices and symbols of popular instruments traded on the easyMarkets MT4 platform. Traders can search for a particular instrument by entering the name into the search engine box (or even a nickname such as Kiwi for New Zealand dollar). Alternatively, traders can navigate by category through the different asset classes and pull up the relevant trade ticket for each financial instrument. Traders can click on the star to create a favorites list. This tool is a very handy way to access all 300 + instruments on the platform through one screen. 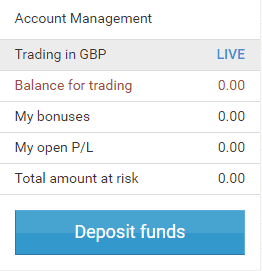 Account Management: This panel on the main screen allows traders to see a snapshot of their trading account including their balance available for trading, any bonuses they have accrued, their open P&L and the total amount of funds at risk. There is also a box to enable deposit of additional funds. Chart Window: This large panel below the trading ticket displays the chart for the trading instrument the trader enters into the ticket. Traders can configure the chart with customized indicators and technical analysis tools. Traders can also chart each instrument on multiple time frames. The trade ticket also has four other tabs attached to it. Open Trades Panel – This panel shows the trader’s active, pending and closed trades. Market News: This tab shows headlines from leading market news services. 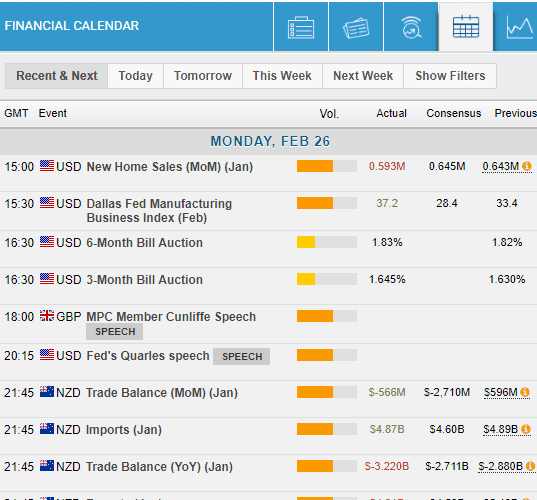 Financial Calendar: This very useful tool shows the dates and times for key upcoming economic announcements. Trading Signals: A Technical Analysis Report for financial instruments traded on the platform. Next to the chart window is one of the more useful features of the platform. 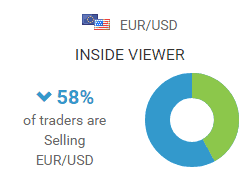 Market Sentiment Tool: This shows what other traders on the platform are trading. Its well-integrated features make the easyMarkets MT4 platform stand out from other systems. 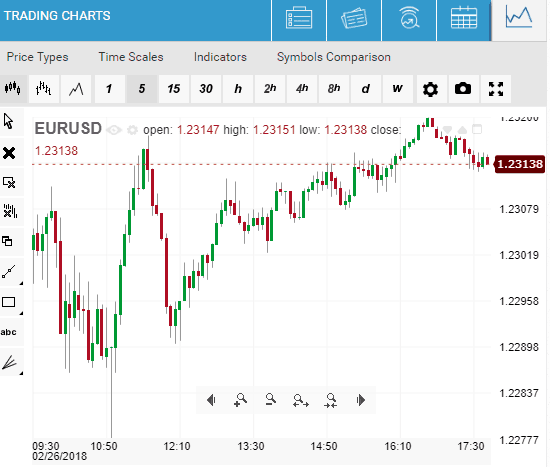 Traders can access their open orders and a ticket window, sentiment indicators and contract information by simply clicking on a symbol in the Market Explorer Engine. All of the features are linked together and accessible from a single screen. 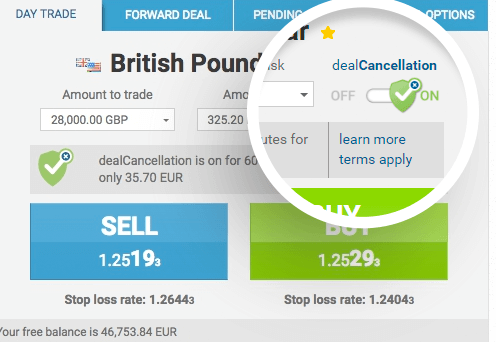 dealCancellation Feature: One aspect of easyMarkets platform that truly makes it unique is the dealCancellation tool offered on spot trades. The tool is designed to eliminate the fear of losing that prevents some traders from making a trade. The dealCancellation feature gives you a one hour window to reverse a trade after making it. If you see the markets moving against you, simply cancel the order. 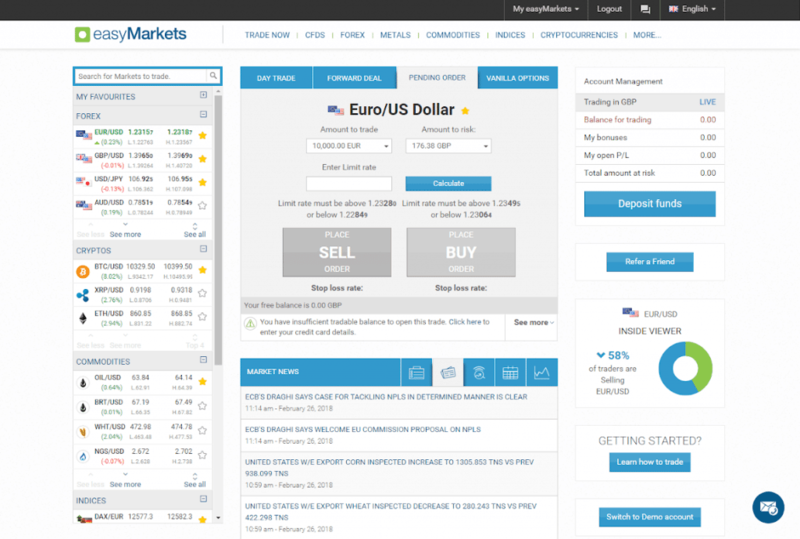 Overall the easyMarkets MT4 platform is a solid platform. Although some very advanced traders may find the charting capabilities somewhat limited, overall it is difficult to find much fault with this platform. Its standout feature is definitely its ability to integrate a lot of information onto one screen. Traders can easily switch between the demo and the live trading account. Traders who open only a demo account can practice on the account for up to seven days after signing up. Traders who open a live account will have unlimited use of their demo account. Getting Started: This beginners’ section has training videos including Introduction to Options and What is Forex? Webinars: easyMarkets offers webinars on a variety of topics for traders of all skill levels. They are taught by experienced traders and cover advanced topics of interest to traders. Discover Series: This educational video series covers the history and event drivers of the broker’s most popular trading pairs. eBooks: These PDF format books cover everything from technical analysis to trading psychology. Knowledge Base: These written materials and videos cover trading, easyMarkets products, the MT4 platform, financial analysis and much more. Unfortunately, sign-up bonuses are something easyMarkets cannot offer due to new legislation. The Markets in Financial Instruments Directive (MiFID) applies to the whole of the EU and is being enforced to provide more transparency in the markets and to offer greater protection to traders. easyMarkets is directly impacted due to two of its headquarters being located in Europe (Poland and Cyrpus). However, easyMarkets isn't alone because any broker located within the EU who is regulated by one of these countries will be unable to offer incentives to customers who sign up with them. That's why it's worth noting that, if you're offered a sign-up bonus after January 3, 2018, the broker is either unregulated in an EU country, therefore, your money might not be protected, or they're not regulated at all and could be operating illegally.